NOVUS Franchising is a welcoming environment for people searching for a future career. We expertly train people with diverse backgrounds to operate a NOVUS Franchise and perform various technical services. 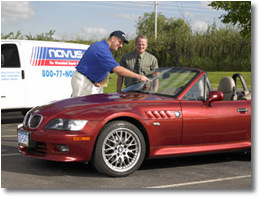 It is not necessary to know how to work on vehicles or do glass repair or replacement before becoming a NOVUS Franchisee. We are also interested in talking with current business owners that are considering integration of a NOVUS franchise into their existing business mix. Today, nearly 400 NOVUS® franchises in North America and 2,000 locations in 40 countries deliver on the NOVUS® warranty promise every day. 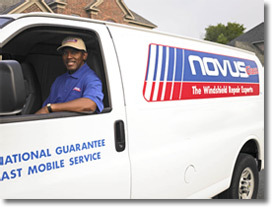 NOVUS® franchisees have performed over 25 million high quality windshield repairs. Are you ready to join us and be a part of the best glass franchise in the world? NOVUS is Proud to announce Our New Company-Based Finance Program! In this challenging economy, which has made it difficult for some qualified candidates to obtain bank financing, NOVUS has developed it's own finance program. You can now own your own NOVUS Franchise for as little as $6250 (Co Brand License) or $6450 (New Repair / Replace Franchise). This down payment will be paid on your first day of training. This finance program is available to all accepted candidates. There is no pre-pay penalties if you decide to pay off your loan in full. At NOVUS, you are in business for yourself but you are not alone. Consider the time, energy and expense independent glass shops must invest to develop brand recognition, marketing materials, product purchasing programs, etc. As a NOVUS Franchisee, you join a 35 year old company with many proven programs and a great reputation. And So Much More Awaits You With NOVUS! Preferred provider program - Glass tool advertising buy programs. There are other glass companies. But...they don't do what NOVUS does for customers with chipped and cracked glass. Click on Request Information for FREE info on how to open a NOVUS Glass franchise today! Please Note: This NOVUS Glass franchise opportunity and other franchise business opportunities, businesses and franchises for sale on this web site are not to be considered as an "offering", "franchise offering", suggestion or recommendation by Franchise Leader™. This advertisement depends entirely on the truthfulness of the information provided by our advertisers which includes, but is not limited to, franchisers, franchise brokers, franchise consultants and business brokers. Franchise Leader™ recommends that you consult a lawyer, financial consultant, accountant or professional advisor before buying a franchise or business opportunity or any type of business. By using this form or any part of our website, you have agreed to all terms and conditions of Franchise Leader™. Please review our Terms & Conditions for more information.